Sober Look: Is China's inverted curve a sign of worsening economic conditions? Is China's inverted curve a sign of worsening economic conditions? In the US an inverted government bond yield curve tends to forecast a recession. An inverted US yield curve has predicted a worsening economic situation in the future 6 out of 7 times since 1970. Here is what the curve looked like 5 years ago, in March of 2007. And as usual the forecast was correct and the US recession officially started in December of 2007 (although the disruption in bank funding markets started much earlier). Inverted curves of course could also indicate a stressed sovereign credit, but as long as there are no immediate issues with the credit, inverted curves typically indicate a risk of worsening economic conditions. 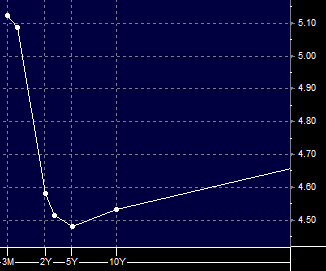 Here is China's government yield curve today. 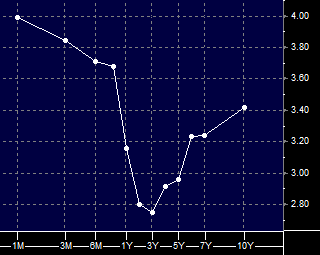 The inversion also exists in China's corporate curves. Some analysts point to lack of supply in longer term paper and other reasons for this inversion. But analysts were also putting forward all sorts of explanations of the inverted US curve in 2007 - some of these explanations had nothing to do with recession risk. And we all know how that turned out.